Created by Henry VIII, it was the most important Tudor dockyard in England. Henry was determined to take centre stage internationally, ushering in a new naval era that required the development of a new yard to repair and build his ships. The Thames-side site was just a short boat-ride away from Henry’s palace at Greenwich. Many notable ships had associations with the dockyard, including the Mary Rose that was housed here in the early 16th century. It was also the final resting place of Francis Drake’s ship, the Golden Hinde, on which he circumnavigated the world. On his return, Drake was knighted in a ceremony at the dockyard on the deck of his ship. We explore some of the impressive archaeological discoveries in pictures in this blog but the fully and beautifully illustrated monograph is available to buy on our publications pages. The construction of the royal dockyard began with the building of a storehouse in the early 16th century by Henry VIII. In the above picture, the bottom courses of the brick walls of the Tudor storehouse, which is a Scheduled Ancient Monument, are exposed in plan. The remains of the 16th- to 17th-century Treasurer of the Navy’s House (centre of above picture). This brick building replaced an earlier Tudor building. Samuel Pepys, diarist and Navy Board official, visited the Navy Treasurer at this house several times in the 1660s. The remains of a tiled floor pictured above, are possibly part of Sayes Court. Sayes Court was home to John Evelyn, the 17th-century English writer, gardener and diarist. Evelyn laid out an important experimental garden at the site, famous in its day, but sadly no evidence was discovered of the garden’s features. A timber water tank dating to the late 18th century can be seen in the foreground of the above picture. In 1777, the Admiralty ordered proper fire prevention provision in all royal dockyards. It is thought that the tank was built to hold water as a fire-fighting measure. A wooden slipway, one of several built or rebuilt in the late 18th century to cope with the demand for ships of the largest class. 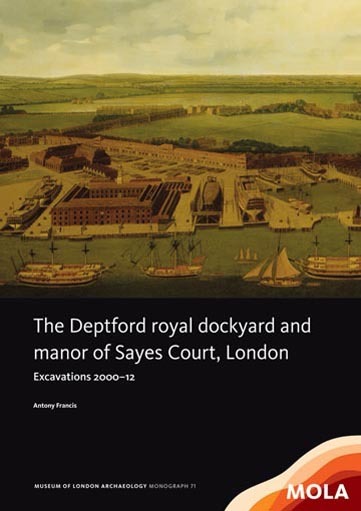 The Deptford royal dockyard and manor of Sayes Court, London: excavations 2000–12 is available to buy at www.mola.org.uk/publications price £30.